Celebrity gossip blog Perezhilton.com dubs itself “Hollywood’s Most Hated Web Site”. 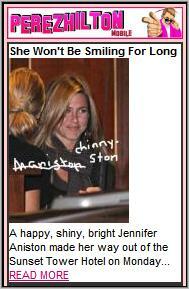 The site is loaded with photos and descriptions of celebrities acting dumb and looking bad. Perez’ catty remarks and the crude captions he adds to most of the photos certainly give the site a unique flavor. The guy just loves to dig up and dish dirt on the rich and famous and it seems to have worked out very well for him. At least it has if legal fees defending the frequently sued site haven’t eaten up all the profits. The site consistently appears in lists of top blogs and celebrity sites and claims some amazing (and often disputed) traffic numbers. Regardless of the true numbers, it’s obvious that PerezHilton.com is an extremely popular site. Until recently Perez Hilton fans who wanted to view his uniquely outspoken style on the go needed a rather powerful smartphone and a 3G connection to handle the site’s big, image laden pages. No more, yesterday Perezhilton Mobile launched at m.perezhilton.com. The mobile site is by Crisp Wireless and uses a simple but usable design. The front page showcases the five latest Perezhilton.com posts with excerpts, thumbnail images and a link to each full post. “Next” and “Previous” links let you go back and forward through the archives more or less indefinitely. If you are looking for something specific there is a search box. The site works well and ably carries Perez’ trademark hot pink styling to mobile. This entry was posted in Entertainment and tagged celebrities, gosip, mobile site review, Perez Hilton by Dennis Bournique. Bookmark the permalink. In my opinion,”width” for the body of mobile sites should never be defined.Instead,”max-width” should be used.